Multiplication has not been a favorite for our youngest mathematician although she does pretty well with her math facts. 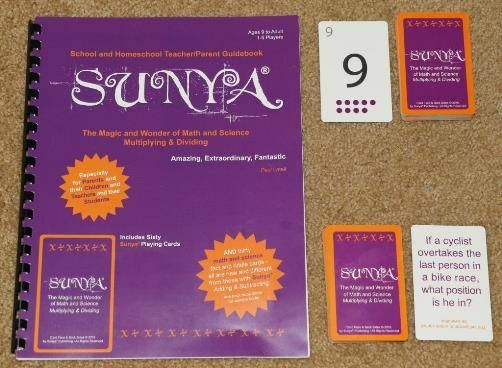 In order to help her solidify and keep her facts at the forefront, we often look for fun ways to practice like playing Sunya- The Magic and Wonder of Math and Science-Multiplying & Dividing by Sunya Publishing . Sunya Publishing is a new company which is still under development. We were happy to be able to be some of the first to experience Sunya- Multiplying and Dividing. Sunya- Multiplying and Dividing comes with two decks of cards: one set is numbers and symbols for creating the number sentences and the other set is math and science riddles, a number line to help with multiplying, and a very detailed instruction manual which also provides instruction for teaching multiplication and division. I will say that the massive amount of details for playing the game made it somewhat cumbersome to get started, but once you figure out the gist of the game it becomes simpler. So how do you play Sunya- Multiplying and Dividing? The purpose of the game is to allow the learner to practice the multiplication or division facts depending on which game is being played. We played the multiplication game to make it easier for us to learn how to play Sunya since she is stronger in multiplication. Since we played the multiplication game, we only needed the equal sign and multiplication symbol along with the deck of numerals, 0-9. The game is not necessarily competitive although there is a winner who is declared by whoever gets rid of all the cards in hand first. I like that the game doesn’t focus on winning, but instead provides room for encouragement. The winner of the game is rewarded by being able to read a riddle for the other players to solve. My daughter loves reading riddles so this was a great incentive. Unlike many card games, players can see each others' cards if the player chooses to place them face up on the floor or table. My daughter played with hers face up because it was easier for her to see her cards this way. This also made it possible for me to help her if she had a hard time coming up with a number sentence. The main objective of the game is for each player to create number sentences using the cards in hand like in the picture below. Once a number sentence is created then the player who created it reads it aloud. Each player takes turns making number sentences on top of previous created number sentences. If the player does not have the right numbers to make a number sentence then the player pulls until she can. The game can be pretty short if the cards line up right or it can be a bit longer. I found that each game took us no longer than 15 minutes which I think is great timing. It kept my daughter engaged and it challenged her to think about her facts outside of a workbook or text. Sunya- Multiplying and Dividing is a resource that I will be using over the course of the summer to help my little mathematician retain her knowledge. I think this game is a good alternative to flashcards.